This won't be happening immediately as we have plans on moving up to the north Georgia mountains, so it most likely will happen after the move. I don't really want to build this up only to tear it down and start over. I will also be doing videos of the build so you can actually see how it all gets put together. For me, watching people actually do the work is more enlightening than reading about it. Before I get started with all of the bits and pieces, let me give you an idea what my vision is for this new aquarium. Obviously, the first thing to consider when doing a new aquascape is trying to make it look like it is totally natural. Sometimes that is easier said than done, and my current aquarium falls into that category. In order to do the things that I want to do, my aquarium needed to be larger, but at the time I wasn't ready to jump in that deep. What I envision is a rock outcropping at the left rear corner of the aquarium that extends to the from left corner and diagonally back toward the rear center of the aquarium. The right side will use driftwood to give the illusion of tree branches/roots in the water. It will be a layered look from front to rear with the rear plants taller. The center will have an indented gap that extends about halfway back near the center of the aquarium. So here are a few images that are some inspiration for my ideas for the new project, none of which look like what I want. Of course. :-) Although I will say that the first image on the second row has some aspects and features that I may try to include. 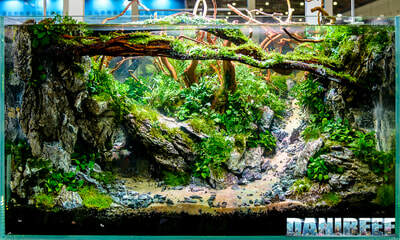 Watch this video by James Findley from "The Green machine" as he builds an aquascape. My current aquarium is about 30 gallons which is probably more than adequate for most people, but it's just too small to do the kind of aquascaping that I would love to do. 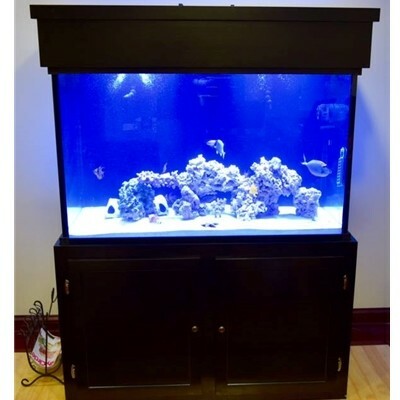 I think I've narrowed down my search to a 100 gallon tank from Customaquarium.com. 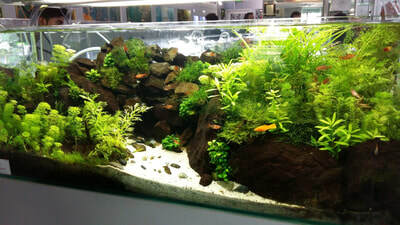 Each aquarium is custom made to each individual specification and each one is made using glass. I could get into the pros and cons of glass versus acrylic, but needless to say, glass is much more durable that will retain a crystal clear view forever. Yes, it's heavier, but that is really the only main drawback. 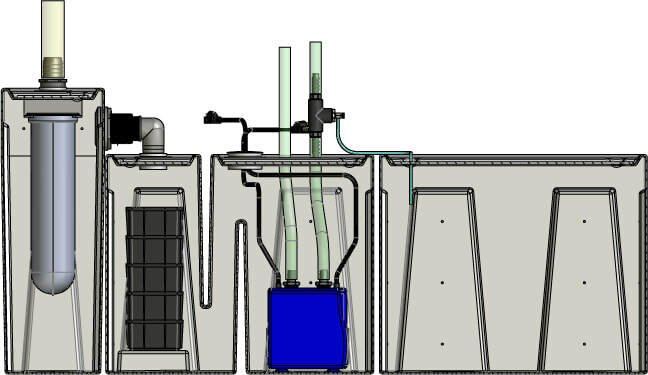 The one I'm considering is 24"H X 48"L X 18"D and is about 81 gallons in size, although it is rated at 100 gallons. 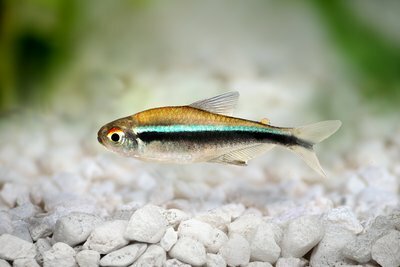 CustomAquariums quotes two figures for the aquarium size, and here is their reasoning behind that. Actual Gallons: tells you the volume of water it can actually hold. Is more accurate for sizing your filtration and chemistry. 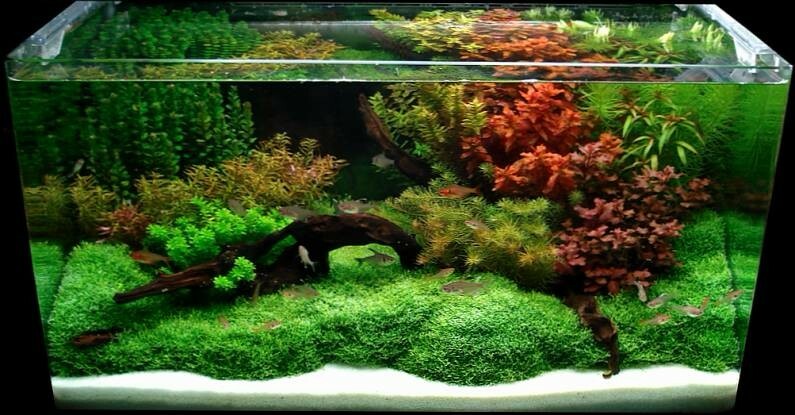 Model Gallons: a number that is more comparable to how other aquariums of a similar size would be labeled. This will help you compare our aquariums to other aquarium brands on the market. An aquarium this size (made of glass) weighs about 180 lbs dry and almost 900 lbs filled with water. Actually, by the time you add rock, substrate, and everything else that will go inside, it will probably weight more than 1000 lbs, so a really good solid cabinet that can safely support that weight is necessary. I'm not sure I like the top part of the cabinet, so not sure about that piece yet. The front and both sides of the aquarium will use 3/8" thick Ultra-Clear non-tempered glass, while the back glass will be 3/8" regular clarity non-tempered. The back will actually be painted using a black enamel paint in order to cover all of the aquarium plumbing and provide a more dramatic and contrasting background to the plants, so no need for crystal clear glass on that side. ​​The tank will come with pre-drilled holes for all of the water hook-up. The key to a great looking tank is the filtration system. instead of me doing a lot of typing to explain what I'm going to use and how it works, here's a great YouTube video that shows you. This system comes from the same company that makes the aquarium. As you can see, this system is a monumental step up from even the nicest canister filters and has lots of great features, and the video will spell those out. It is of course, a lot more expensive than the Fluval FX6 canister filter that I originally was going to get, but it is much more versatile and dramatically increases water capacity (to help reduce fluctuations in water quality) as well as the health of the tank. The image below shows how it's all connected. in addition to other media, one of the media trays will hold a bag of Seachem's Purigen, and I swear by this product. It helps to remove all harmful chemicals from the water and helps to extend the purity of the water so you can go longer between water changes. Lighting has change a lot over the last ten years, especially with the advent of the newer LED technologies. 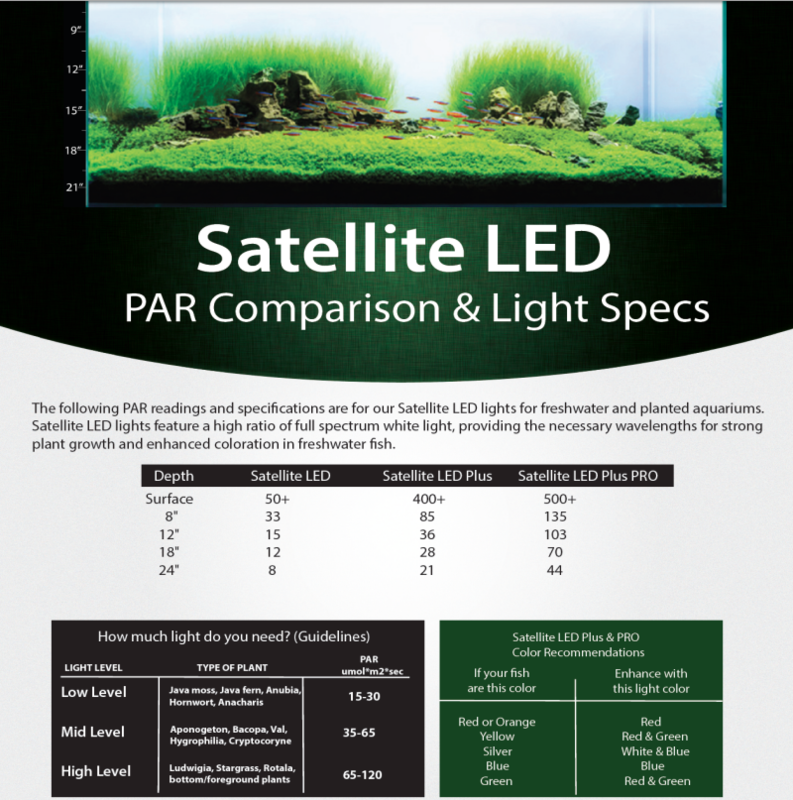 My current aquarium uses a LED lighting system from Current-USA.com called a "Satellite Plus Pro", a 24 Hour Freshwater Aquarium Light with Wireless Remote Control and Timer. Again, here's a great YouTube video that describes the features. Two memory locations for custom color spectrums"
​I love my small version, so I know I'll love this larger one. If you want the optimal plant growth, you have to start with a great substrate for the plants. All too often people will throw in some gravel (which has absolutely no nutrients) and plants and wonder why their plants aren't doing well. So in order to do this correctly, I will be using the best substrate that I can find. You only get to do this once, so do it correctly. It provides a method of supplying nutrients, minerals, and other plant nuritional needs. Is a home for all of the beneficial bacteria that help to break down the plant and food waste. 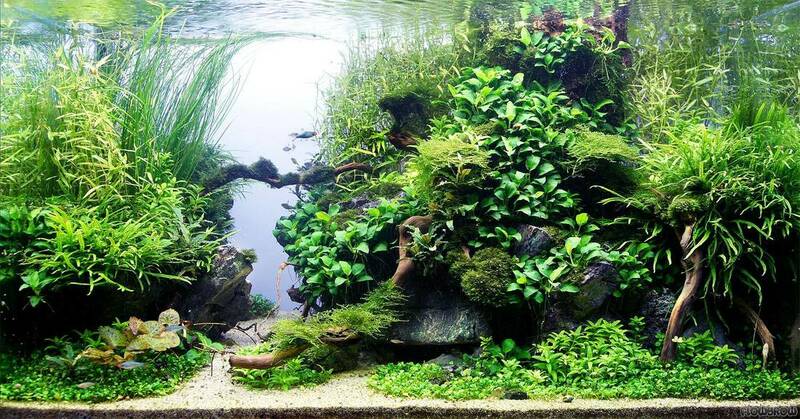 Master aquascaper James Findley recommends several layers for the substrate. Base Substrate Layer - This first layer will be volcanic pumice (otherwise known as lava stone). Because this stone is very porous with lots of holes, it is ideal for the growth of beneficial bacteria as a secondary biological filter for the aquarium. It aids in the movement of water in the substrate creating an aerobic environment, and helps nutrients in the water get to the roots of the plants . These lava rocks are also ideal for building height for the aquascape, and I will be using the lava rock below the substrate where I need to create elevated areas. Substrate Additives - Some people use these, others don't, but they certainly can't hurt to help create that perfect plant environment, especially in a brand new tank. Primary Plant Substrate - This is what the plants actually take root in and is the main substrate for the entire aquarium. The depth of this substrate depends primarily on the types of plants you are going to have, but also the height and slope of the base. My choice for this substrate will be Carib Sea Eco-Complete. "The secret lies in rich basaltic volcanic soil which contains iron, calcium, magnesium, potassium, sulfur plus over 25 other elements to nourish your aquatic plants. 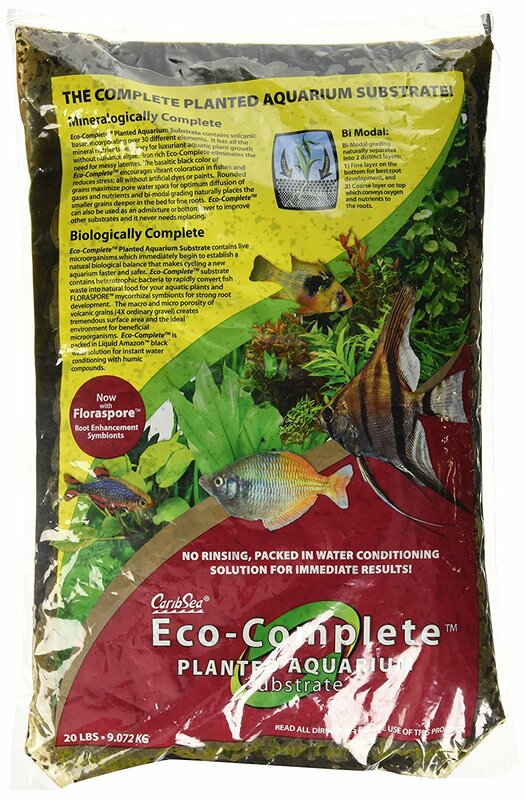 Eco-Complete Planted Aquarium Substrate is mineralogically and biologically complete, giving you luxuriant aquatic plant growth without nuisance algae. Iron rich Eco-Complete eliminates the need for laterite. No artificial dyes, paints, or chemical coatings. Eco-Complete has highly porous spherical grains for optimum diffusion performance and contains live Heterotrophic bacteria to rapidly convert fish waste into natural food for your aquatic plants. It establishes a natural biological balance which makes cycling a new aquarium faster and safer." It could end up taking 5-6 20 lb bags to do the job. A well done aquascape would not be complete without driftwood, and many freshwater planted aquariums use some driftwood in their design. There are all types of varieties of driftwood to choose from, I am using Mopani in my current aquarium, but I am open to other types. Driftwood can be used to creatively make tree roots, broken tree branches/limbs, etc., and the wood adds a natural element that fits in perfect with the other hardscape materials, while contrasting yet complimenting the lush green plant life. Another nice aspect about the wood, is that aquatic plant life can be attached to the wood so that the root system eventually takes hold and becomes the home for the plant, it helps to give the aquascape the appearance of being there a long time. The plants can be tied on using thin cotton thread or even stuffed into holes in the wood. 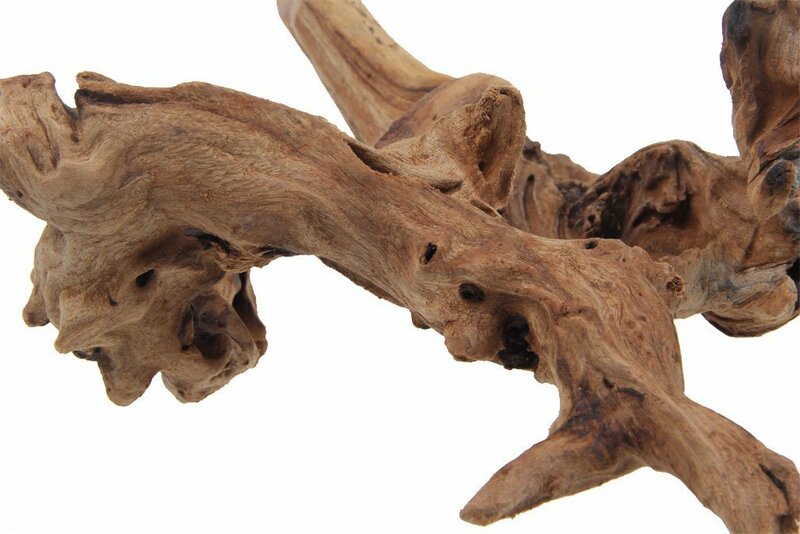 Driftwood comes in any shape and size you can imagine, and that makes it easy to blend it in to the aquascaping. One of the most visible hardscape components are rocks. and often people end up using multiple types of rocks in an aquarium, and it doesn't look natural. The exact type of rock that will be used (we're talking "exposed" rock) depends on the geographical location of the area you are trying to duplicate. In my case, I want my design to mimic what you might see with a slow moving mountain stream, so there are certain types of rock that you would never find in that environment. The lava rock that is used as the substrate base layer and very small and will be covered up by the primary layer. Also, where the base needs to be elevated, the lava rocks will be stacked and covered by the primary substrate, so they will be hidden as well. 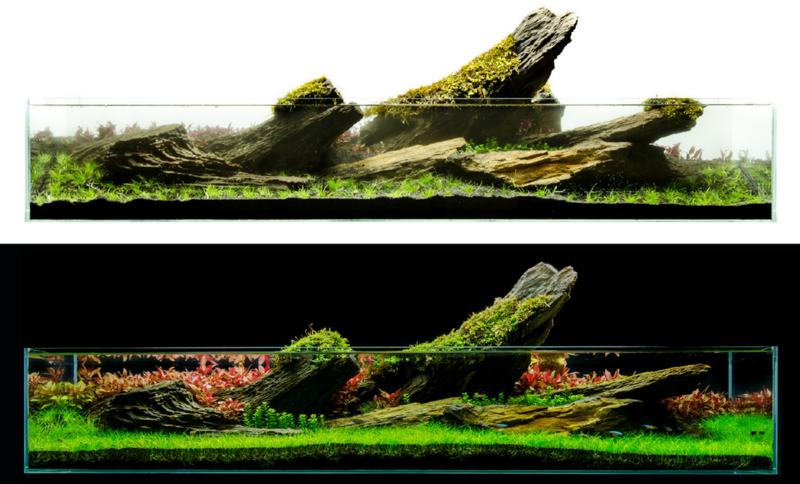 It's really the visible rock that needs to be carefully chosen to match the geographical location you are modeling your aquascape after, but the main point being don't mix and match the visible rock that you'll be using. Two types of rock that are used quite a bit in aquascapes are lava rock and dragon stone, and the two images below show you how they might be used in an aquarium. I have the same problem when landscaping my yard. I may see a plant or a shrub that I like, but I have no idea what the name is. I think that's one big advantage the good landscape design people have, they know their plants, how they grow, how big they get, and what environment they grow best in. One of the biggest things to consider is how large each plant gets. 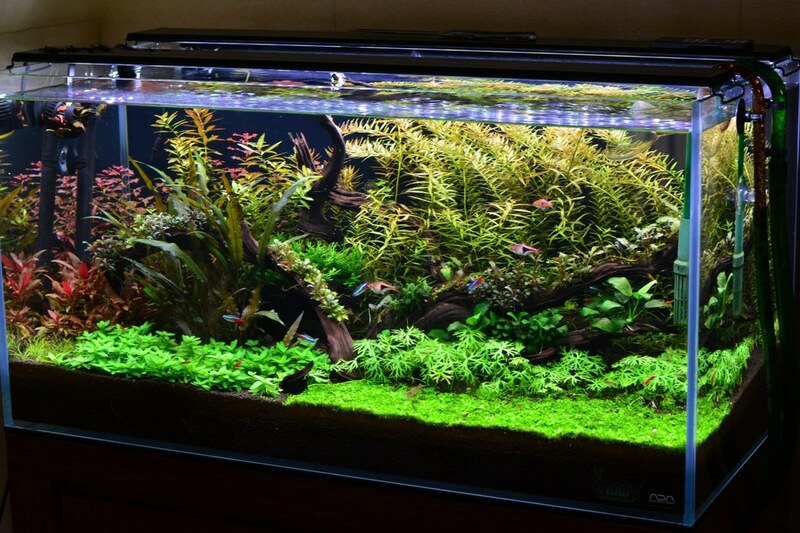 When designing the aquarium, you want to have front to rear layers in order to provide depth and perspective to the layout, and the plants have to be arranged so that they help provide those layers. 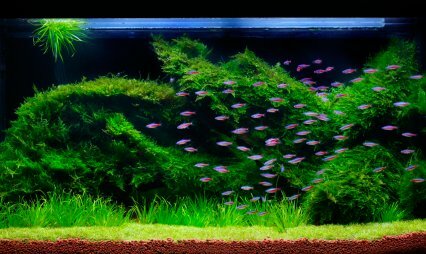 Also, different plant colors add variety and help draw the eye to different areas of the aquarium, so strategically placing plants becomes important. 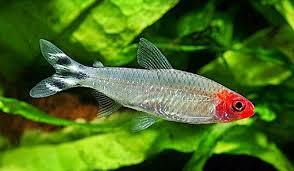 So... what I am going to go is do some studying and research on what plants the really good aquascapers use. Mr. Findley will list in his videos and blog post the plants that he uses in his designs, so that will help immensely. This is the one area that I really need help in, so I'll take my time to get it right. Once I'm ready to buy, I'll do a new post with all of the plant details. 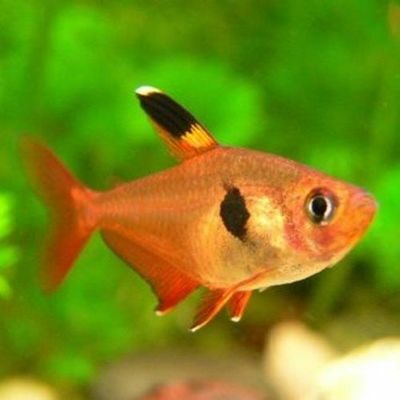 This one is not so hard, and I will be continuing the fish theme I currently use in my existing tank, and those fish will be transferred to the new aquarium once it is complete. 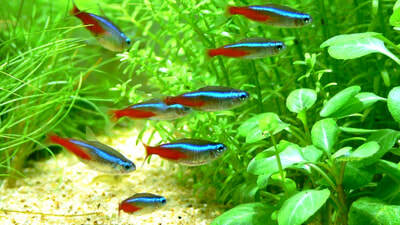 I prefer small shoaling fish and lots of them, so this new tank will primarily a tetra tank. In my existing tank, I have Neon's, Black Neon Tetra's, Rummy Nose Tetra's, Gold Neon Tetra's, and some Red Phantom Tetra's, and I will be expanding those numbers for the new tank. In addition to those fish, I also have several Cory cat's as well as the best little algae eater fish around, Otocinclus catfish or Oto's. 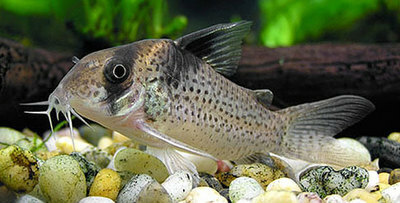 "The Otocinclus Catfish is the algae-busting favorite of aquarium hobbyists. Even award-winning planted-aquarium experts like Takashi Amano will employ this tireless algae eater. 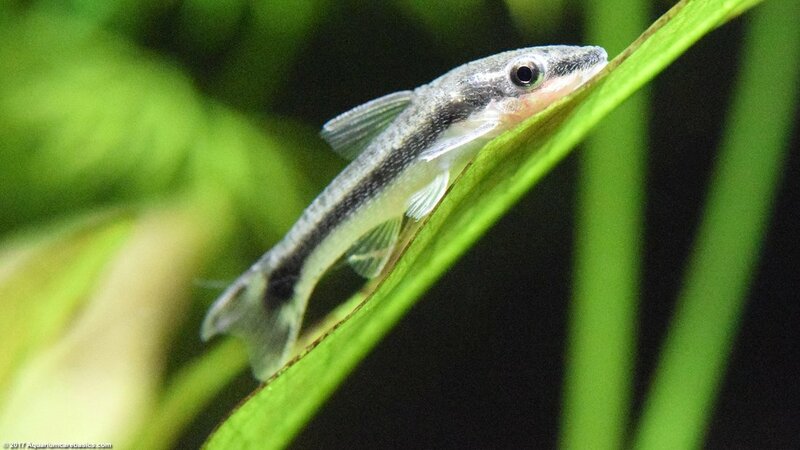 The diminutive Otocinclus Catfish does a great job keeping aquarium glass and plants free of distracting green. Your aquascape and schooling fish will take center stage when the Otocinclus Catfish turns problem algae into delicious meals using its sucker-type mouth." So here is what I'm thinking... these totals include the existing fish. One item I haven't mentioned that will be in the new aquarium, and that is the freshwater Cherry Shrimp (Neocaridina davidi). 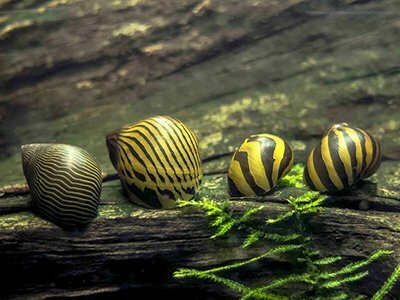 These are VERY cool little guys that are constantly moving around and cleaning things, and are a great addition that adds a lot of interest to a planted freshwater aquarium. I will probably start off with about 8 of those. 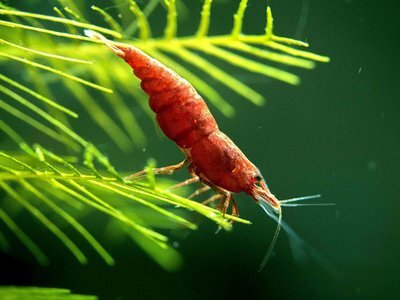 ​Luckily tetra's are not the kind of fish that will bother the shrimp. These numbers will change as I get closer to the time to get the new fish, and again, I will make a separate post about that as well. 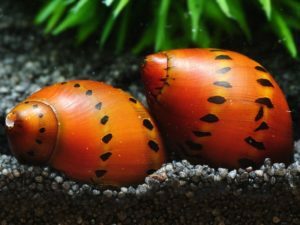 I've added some images in the gallery below of the fish, snails and shrimp that will be in the aquarium. I will be making updates as I continue to plan and make purchases, but this could be a drawn out process, as we haven't decided exactly when we are going to move. Before I start this tank, all of the bits and pieces will be decided upon and purchased in advance except for the plants and the fish, so as I make purchases, I will also make updates here. ​I didn't mention that I will probably be moving my existing fully automatic CO2 setup to the new tank to help with plant growth. 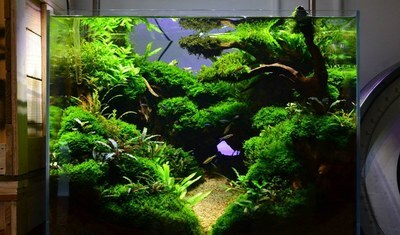 I have a very nice CO2 setup but I do need to get a new diffuser for use with the new tank. 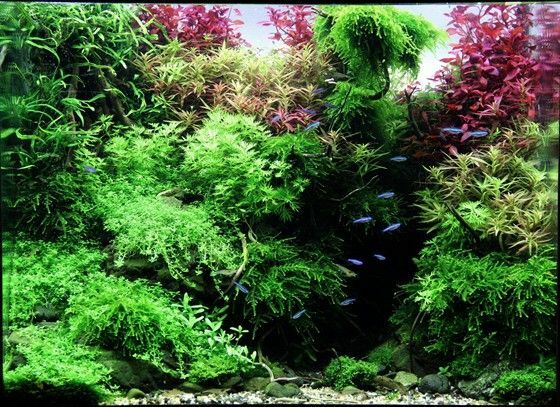 And yes, aquarium plants need CO2 for their optimum growth just like plants that grow in air! I really have no idea why I think that doing this is so cool. I think it's that I'm trying to create the perfect living and breathing environment that looks completely natural in a non-natural space, and yet make it as self sustaining as possible in order to minimize the amount of work that is needed to maintain the aquarium. If you'd like to see more about aquascaping, take a visit to this website and read about James Findley and his beautiful aquariums, as well as how he designs them, it it truly amazing to watch. I'm sure I've left something out, but if so, I'll go back and add/correct it. In the meantime, please keep checking back for any updates! It's been quite a while since I've posted anything here, so lots to talk about. First, everything is now installed in/on the aquarium. The CO2 injection is working well, I'm now learning how to get my PH stable and at the correct level, while still pumping CO2 into the water. It's a little bit of a struggle to find that balance, but I'm getting there. Having an automated way to cut off the CO2 when the PH gets too low is a great (and safe) way to help manage the process. I have everything on a schedule now so other than feeding, it's all automated. The lights and CO2 come on at 12 PM and run until 8:15 PM. The lights have a sunrise/sunset mode, so they start a 15 minute ramp up at 12 PM and are at full brightness at 12:15. Same for sunset, they begin to ramp down at 8 PM and are completely off at 8:15 PM. I turn on an aeration stone at 8:30 PM and run it until everything turns on at noon, at which time I turn the air off. Right now the lights are running at 80% of their maximum intensity. I had dropped as low as 60% when I was having the algae issues, but now that I know my CO2 levels in the water (finally got a GH//KH test kit), I've been able to bump the lights back up for now. I'm also going to keep a running post as a log of changes. I should have been doing this all along, but I got lazy. Of course. So I'm back-tracking to about April 1 with approximate dates and I'll keep it up from now on. I also have lots more pictures to post, the tank looks different from what you see in the pictures that are currently being displayed, so I'd like to get some of these updated. Here's the log that I promise to keep up, I should have been doing this all along. I'll have to start with what I remember about the last few weeks of April, but I will now updated this as I make changes. 04/01/15 - Filter and Purigen change. There is now more than 5" of filter media in the canister, probably more than needed. I will pull one of the pieces during the next change. 04/15/15 - Removed one of the two 50 micron filter pads that I just added, it was just too much restriction to the flow. Still may not have enough flow and might have to take out another piece of media. 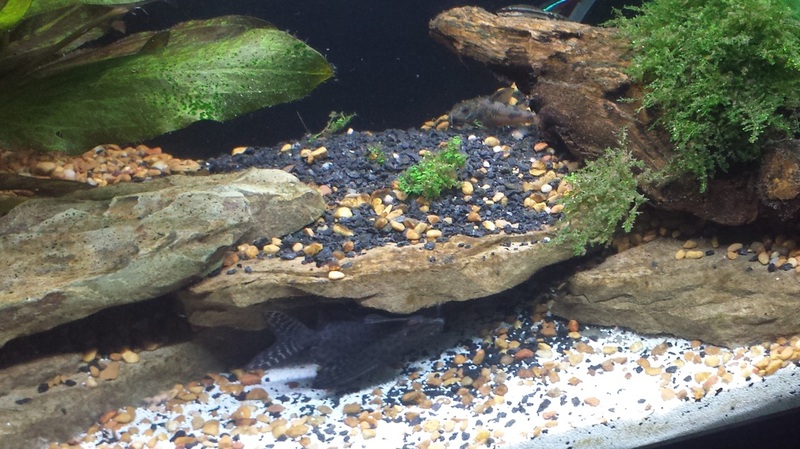 04/18/15 - Purchased (3) Otocinclus catfish to help get rid of the algae. These guys are the best, as they have polished every leaf in the tank. Highly recommended for a planted tank. 04/22/15 - Finally got a GH/KH test kit. From that test, I can calculate how much CO2 is in the water. Once I tested, I discovered that my CO2 levels were too low and I wasn't pumping enough into the water. 04/25/15 - I've increased the light to 80% from 70%. Now that almost all the algae and the blue-green bacteria is gone, the plants are doing much better, and the increased CO2 warranted the increase in lighting. I am also dosing with some Seachem Alkaline buffer, to get the PH in the tank up higher, by the end of the day I'm down to 6.7-6.8. I'd really like to see it go no lower than about 6.8-6.9 after a full day of CO2 dosing. 04/28/15 - Lights are up to 90% intensity now. I intermittently get pearling on the leaves, so I'm just about where I need to be. 05/15/15 - The lights are now cranked up all the way to 100%. The plants have just exploded in growth. I've actualy had to turn up the CO2 output since the plants are now consuming more. I am also doing a dose of Excel daily and Flourish twice weekly. One of our Angel Fish died... it looked like the intestines ruptured and eventually killed the fish. He had what looked like a hernia on his side, that eventually ruptured and intestines came out. He never really seemed to be in any pain of stress until the very end. So we're down to one right now and we're debating getting another one. I know how Angel Fish can be with new fish, so I'm not quite sure what to do yet.